It is with deep sadness I have to announce this very bad news. 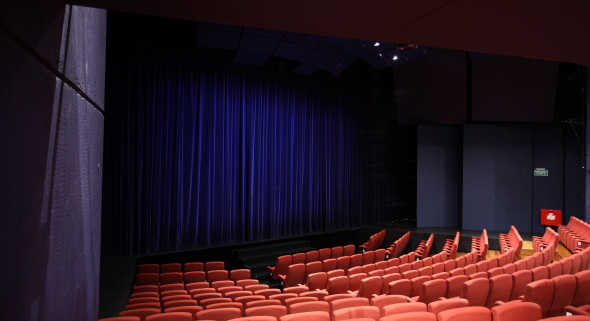 It appears as our wonderful Maidment Theatre in Auckland has been closed. This is nothing short of a disaster and all I can say it I am so glad we were able to have the Hank Marvin Gypsy Jazz group play there on November 20th 2015. It appears the theatre is an earthquake risk and at this stage we are not certain if it will reopen. There is no doubt this was one of the very best artistic theaters in this country and we are devastated about this news. Below is a letter send out by Lester MaCrath general Manager. We regret to inform you that over the Christmas break we learned that the University of Auckland has closed the Maidment Theatre, as the building is deemed an earthquake risk. We have been advised that the closure is for an indefinite period, affecting the four productions we had scheduled at the Maidment Theatre in 2016. As a valued Auckland Theatre Company subscriber we wanted you to be the first to know this news; and to reassure you that we are in the process of securing alternative venues for the affected productions. It is our intention that the full 2016 season will proceed as planned. Accordingly, we expect to announce replacement venues for three of the four affected productions by the time the box office re-opens for business on Monday the 11th of January. You have been contacted today as our records show you have already subscribed for the 2016 Season. If you have submitted a subscription form and not received tickets, your form will be held until the new venues are confirmed. For those of you who have already received your tickets our Box Office team will be in contact with you to advise you of seat re-allocations and hard ticket swaps in the next couple of weeks. Please be assured that it is our highest priority to retain your seating preferences and any special requirements. In most cases seat re-allocations will be a direct swap into the new venue with very little change to your current seat selection. If you have any immediate questions please contact the Box Office team on 309-3395 or at boxoffice@atc.co.nz, otherwise we will be in contact in due course. Thank you for your patience during this challenging period. We appreciate your continued support and look forward to presenting a stellar season of theatre in 2016.